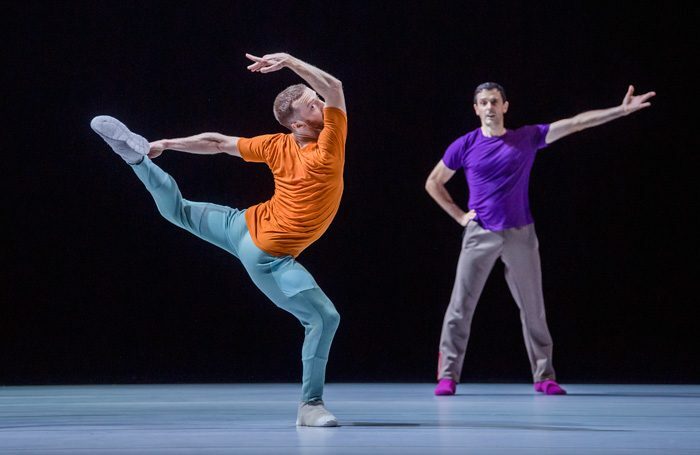 Quiet it may be, but William Forsythe’s latest evening of dance at Sadler’s Wells resounds with an extraordinary cerebral and imaginative force. By paring away music from movement (in Act I’s Prologue, Catalogue and Dialogue), Forsythe asks what it is to dance, demanding a renewed concentration from the audience (as well as the suppression of sneezes, snuffles and inconvenient stomach gurgles). We see physical counterpoint and the basic mechanics of balletic vocabulary laid bare via a pair of dancers with the carriage of proud birds who then swivel and slide into nervy, rapid-fire inflections of the shoulders, elbow and hips. The level of intricacy and precision is exhilarating, the lines fizzle and sing, emphasised by highlighter-bright gloves and shoes. Dancers channel bursts and bouts of kinetic energy not simply as a codified language, or a reaction to sound and rhythm, but an interior impulse with its own mathematical and emotional configurations. Throughout the evening, Forsythe explores ballet’s geometric and baroque foundations in relation to the technical rigours of hip-hop. B-boy Rauf ‘RubberLegz’ Yasit more than lives up to his name, plaiting his plasticine limbs and lodging his foot in his armpit with breezy, boneless fluidity. Act II, set to music by Rameau, contains an earthbound but sublime duet for Yasit and long-time Forsythe collaborator Christopher Roman that builds poignancy from the carefully interlaced placement and torsion of torso, legs and extremities. There are puckish and airy male duos too, while dancer Parvaneh Scharafali illuminates the stage with pulses of sinuous power.